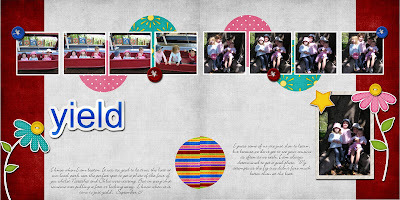 The Curly Wirly Twirly Girlies: The expanded layout. I flipped Denise’s super template and did the other pictures I tried to get that day LOL to make a 2 page LO. You have to know when you are beaten, the best picture is on its own. Denise has another fabby template up in response to a request from Alyson P, for a monthly summary page. Boy is she fast, and good ! Her own layout with it is just gorgeous, makes me want to play with the So Sunny kit, but first we have to sweep out under the house and garage. I am motivated to work fast this morning LOL.